What is to come for cochlear implants? Once diagnosed with hearing loss, no matter the severity, it's important for individuals to become aware of the many treatment options available. Total hearing loss can leave an individual feeling isolated from their surroundings and excluded from the conversations of their family and peers. For some, hearing aids and other "bandaid" approaches are not sufficient and one might seek a more intensive approach to curing or repairing the existing damage. Depending on the cause and of the hearing impairment and the type of hearing loss incurred, "curing" the damaged cells might not be a viable option. To date, there are only a few available options for hearing loss cure and each come with their own price tag chance of success. Advances in technology, however, are steadily edging toward the possibility of full rehabilitation. The Hearing Loss Pill is designed for those who seek healthier hearing and who are interested in optimizing their existing hearing ability through natural ingredients. While the pill is not able to re-create damaged hair cells (it is not to be considered a cure), it has been shown to improve the performance of the nerves within the ear that are still functional and thus improve hearing. The ingredients are combined in such a way that the pill targets the nerves within the ear, providing protection against extreme noise damage while also affecting the nerves within the brain, to optimize the process for which sound information is registered. The Hearing Loss Pill not only optimizes the cells for receiving sound, but it also guards the ear against the free radicals that can cause further damage. When individuals are exposed to extreme sound, free radicals are released into the blood stream; it's these free radicals that attack the hair cells within the ears and cause potential hearing damage. In addition, there are a number of necessary compounds included in the Hearing Loss Pill formula which are known to be essential to proper hearing function. These compounds are another integral component to The Hearing Loss Pill. Cochlear implants are becoming a more prevalent approach to improving hearing loss in patients. These complex electronic devices are surgically implanted to help restore sound in individuals who are experiencing profound hearing loss or even total deafness. Sometimes referred to as 'bionic ears' the application has proven to help patients experience at least some sort of increased hearing, although it can be considered less pure than natural audio reception. A transmitter that sends power via electromagnetic induction. 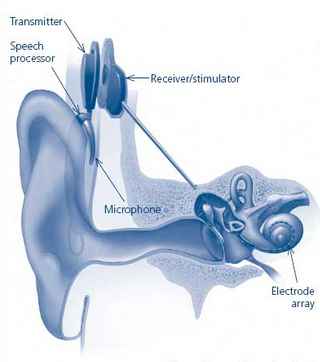 The internal components of the cochlear implants consists of a receiver and stimulator which are secured into the bone. In addition, 22 electrodes are woven through cochlea and work to facilitate communication between the nerves and brain. While an implant does not restore normal hearing, it can give a deaf person a reasonable advantage by clarifying sounds in the environment and helping him or her to understand speech. Cochlear implants and hearing aids use very different technology and should not be considered synonymous. Hearing aids amplify external sound in such a way that it can be detected by damaged ears. Cochlear implants, on the other hand, bypass damaged portions of the ear and deliver sound directly to the auditory nerve. The auditory nerve interprets signals delivered by the implant and delivers them to the brain, which then recognizes the signals as sound. Patients with cochlear implants should be patient as hearing through the device is different from normal hearing. It can require time to learn or relearn. Some of the benefits provided include giving people the ability to enjoy a conversation in person or by telephone and even more importantly, recognize warning signals in the environment. Individuals considered to be good candidates for cochlear implants are patients who have competent speech, language, and communication skills. Historically, these individuals have lived some of their life with the ability to hear but now has experienced severe sensorineural hearing loss in both ears. Those with only mild hearing loss should not yet seek a cochlear implant as they can see satisfactory results with other treatment methods (The Hearing Loss Pill or a hearing aid). Also people who have grown up deaf may find the implants ineffective and irritating. Both children and adults who are deaf or severely hard-of-hearing can be fitted for cochlear implants. Adults who have lost all or most of their hearing later in life often can greatly benefit from cochlear implants. By learning to associate the signal provided by an implant with sounds they remember, the device is more effective for these sort of cases. This ability provides recipients with the ability to understand speech solely by listening through the implant. In other words, they do not require any visual cues such as lipreading or sign language. Implementation of a cochlear implant requires a surgical procedure and significant post-op therapy. Therapy is essential for patients to learn, or relearn, the hearing sense. The device is not suitable for everyone and the decision to receive an implant should come only after discussing the procedure with an experienced cochlear-implant surgeon. The procedure can be expensive; there are five areas tied in with the bill of the surgery including an evaluation, the surgery, purchasing hardware, hospitalization, and subsequent rehabilitation. In total,the procedure can range between $50,000 and $125,000 US dollars, some or all of which may be covered by certain health insurance companies. Individuals should check with their respective health care providers before deciding on this route. It may be that some individuals choose not to have a cochlear implant for a variety of personal reasons. Time required for surgery can be up to five hours. Patients then remain in the hospital for up to a two days and should allow up to one month for the area to fully heal. Once the area has healed, the device is 'turned on' and patients can begin their post-op therapy to allow the brain to start adjusting to hearing new sounds. While surgical implantations are usually considered safe, complications are a known risk factor for any surgical procedure. Additionally, patients should be prepared for the intensive learning curve that follows the surgery. Considering the process involved to relearn how to interpret the sounds created by an implant, can help individuals prepare for what's to come. Time, practice and patience are all essential to this process and speech-language pathologists and audiologists are frequently involved. As technology continues to advance and the number of follow-up studies rise with individuals who have received implants, researchers are looking into the ways in which cochlear implants might be used for other types of hearing loss. Using Stem Cell Treatments as a cure for hearing loss is a relatively new concept. It wasn't until the 1980s that scientists discovered in their labs that even after chickens' hair cells had been deliberately destroyed the cells grew back. Damaged hair cells within the ears is the cause for hearing impairment, so this notion that damaged hair cells can re-grow is ground-breaking for the hearing loss industry. Today there are several promising leads that may overcome the lack of spontaneous cell recovery in mammals. For example, in certain studies, when stem cells were inserted into the ear of a mouse, it was followed by the appearance of new cells in several different areas of the cochlea. One way in which scientific leaders in this field are attempting to regenerate cells is to stimulate existing stem-like cells in the human inner ear to regenerate new hair cells. To do this, molecules are delivered which will stimulate new hair cell production. Another approach is to transplant cells into the damaged ear which can then give rise to new hair cells in that area. While cochlear implants act as a good supplement to hearing function, the use of a biological method to repair the damaged cells within the cochlea could lead to restoration of hearing without the use of prosthesis. By surgically implanting the stem cells within the cochlea, scientists aim to regrow and restore the natural hearing function without the need for an artificial hearing device. Still in its early stages, stem cell treatment is currently only available in the USA, Canada, and the UK as part of medical research. 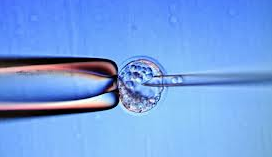 Individuals seeking the stem cell treatment must travel to China, Mexico, the Middle East, or Thailand and costs can range from $18,000 to $30,000 USD. For these treatments, patients are required to pay the money in cash. While research into this method of treatment continues, there are no guarantees and thus far the results from procedures abroad are inconclusive. Stem Cell treatment and cochlear implants can be valid treatment options for those looking to rememdy severe cases of hearing impairment. For an approach to more mild cases of hearing loss, The Hearing Loss Pill is a viable option. For more information on the pill and to determine you're a good candidate, visit our homepage.